The Public Security Ministry and other branches of Israel’s defense establishment are advancing a bill to outlaw the organization of Palestinian guards stationed on the Temple Mount to block entry by Jews. The guard corps, staffed by Muslim men and women, has often been at the center of clashes with Jewish worshippers during the past year. The guards are called “Mourabitoun” in Arabic, a term used to describe an advance guard meant to protect Islamic holy sites from heretics. Dozens of men and women are part of the guard, and are present near the mosques on the Temple Mount – which is worshipped by Muslims as the Noble Sanctuary – day and night. 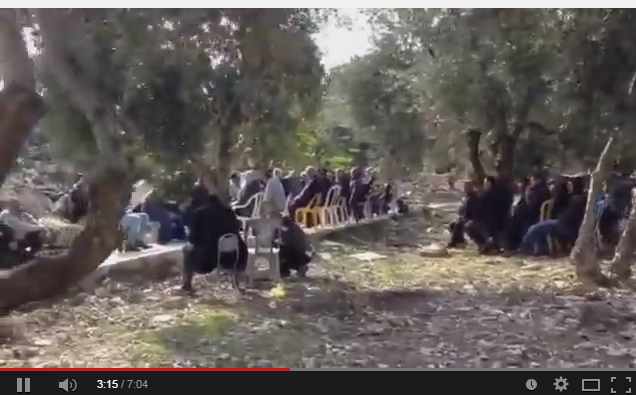 They are funded by various Islamist parties, including some extremist groups in Israel. In many cases, the guards, particularly the females, have been involved in clashes with the Israel Police or Jewish visitors to the Temple Mount. A senior security official told Haaretz that the defense establishment has learned that the Mourabitoun guards receive a monthly salary of between 3,000 and 4,000 shekels ($776 - $1036). Some of the funds come from the Gulf States, through the occupied territories by way of couriers, and from there the money makes its way into East Jerusalem. Recently, the Shin Bet and Israel Police apprehended a courier at the Jordanian border in possession of 1 million shekels, meant for the Mourabitoun guards. 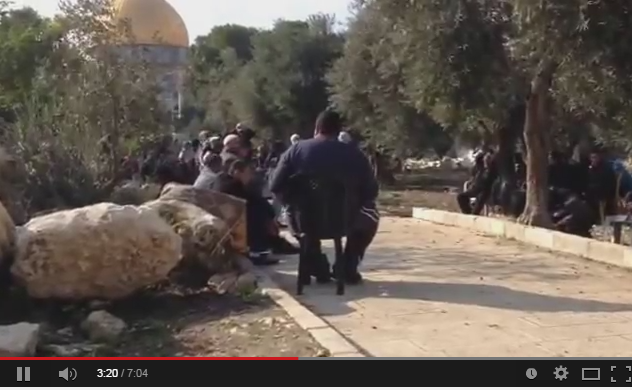 are sitting on the pathway directly leading from the raised platform at the center of the Temple Mount towards the east. The pathway leads to the Eastern Wall where those who visit pause to observe the sight, to hear a short lecture on how the compound looked when the Temple was extant and to silently and motionlessly meditate. The Holy Places shall be protected from desecration and any other violation and from anything likely to violate the freedom of access of the members of the different religions to the places sacred to them or their feelings with regard to those places...Whosoever does anything likely to violate the freedom of access of the members of the different religions to the places sacred to them or their feelings with regard to those places shall be liable to imprisonment for a term of five years. but they are establishing a new status quo because three years ago they weren't there. The police, if they are so zealous on behalf of the status quo, should be rolling back this new status. CAIRO, November 29, 2014 – (WAFA - PLO news agency) – President Mahmoud Abbas stated Saturday that the Palestinian people could no longer live with the status quo in the occupied Palestinian Territory. It may come as a surprise to many that Vladimir Ze’ev Jabotinsky...was not that different [than Herzl] in his views of a future Jewish state. While his conviction that Jews should be allowed to settle on both sides of the Jordan and his vision of a state with a strong Jewish army are certainly no secrets today, it is less known that all [?] a Jewish state meant for him was a territory in which Jews enjoyed a sufficient degree of sovereignty in their internal and external affairs and in which they constituted a majority. In The Jewish War Front, his last book before his premature death in 1940...Jabotinsky draws on the draft constitution worked out by the Revisionist Executive in 1934. In every Cabinet where the Prime Minister is a Jew, the vice-premiership shall be offered to an Arab, and vice-versa. Proportional sharing by Jews and Arabs both in the charges and in the benefits of the State shall be the rule with regard to Parliamentary elections, civil and military service, and budgetary grants… Both Hebrew and Arabic shall be used with equal legal effect in Parliament, in the schools, and in general before any office or organ of the State… The Jewish and the Arab ethno-communities shall be recognized as autonomous public bodies of equal status before the law… Each ethno-community shall elect its National Diet with the rights to issue ordinances and levy taxes within the limits of its autonomy, and to appoint a national executive responsible before the Diet. ...to turn Israel from a Jewish state into a more Jewish state is not only an unnecessary provocation to Israel’s Arab citizens. It also ignores the vision of its founders right underneath their images proudly displayed inside the Likud headquarters. The book, and it may come as a surprise even to Brenner that it was reviewed the Foreign Affairs, is no surprise to my readers as I have quoted from it and particularly that passage many times. I even quoted an extreme anti-Zionist quoting that book favorably. One always need be careful when dealing with quotations from Jabotinsky. Excerpts must be faithful to the fundamental conceptualization of the author's thinking so that the quotation cannot be used for a purpose which is contrary to the author's outlook. Today's reality amongst Israel's Arab minority is not quite that. They do think of their status a tragedy, the events of 1948 that caused their status a nakba, catastrophe, and have, in increasing numbers and ferocity, acted with violence to the idea of a Jewish state. Can Jabotinsky's idyllic vision be easily applied today, without a period of reduction of Arab hostility on the one hand and, on the other, a coming to terms with Israel, by Arabs both within and without? The draft is not an official programme, and the writer is not prepared to defend it in all its aspects. ...the Jews are ready to guarantee to the Arab minority in a Jewish Palestine the maximum of the rights which they claimed but never obtained for themselves in other countries. 1. Provided nothing be done to hinder any foreign Jew from repatriating to Palestine, and, by doing so, automatically becoming a Palestinian citizen, the principle of equal rights for all citizens of any race, creed, language or class shall be enacted without limitation throughout all sectors of the country's public life. there are certain inbuilt constitutional privileges, like the one above echoing Israel's own Law of Return, which Arabs combat and refuse to accept. Should the Christian Arabs, or any other group of citizens reasonably justified in claiming autonomy, also demand a measure of independent recognition, Parliament shall be entitled to grant the request. Do our progressive liberals accept that? Would that lead to bifurcation of our society? Is that good or bad? Should not all citizens feel patriotic and compliant to a general state culture? 1. 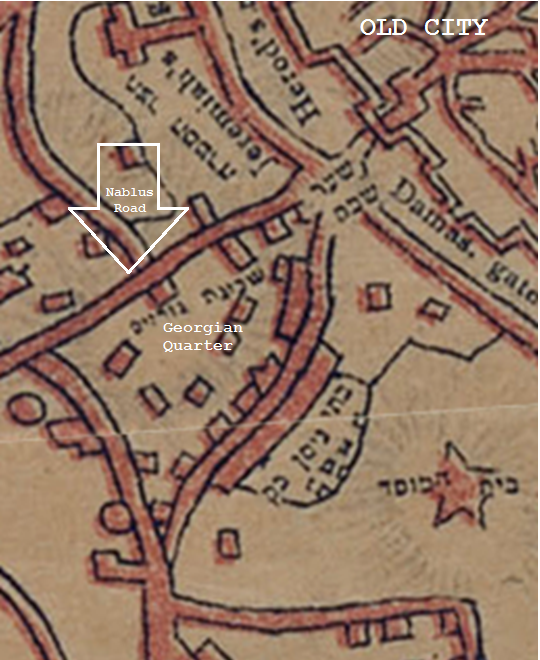 The relevant areas within the Old City of Jerusalem, to be delimited under the authority of the League of Nations, shall enjoy the same measure of extra-territoriality as that universally recognized in the case of embassies. Whether the Arabs would find all this a sufficient inducement to remain in a Jewish country is another question. Even if they did not, the author would refuse to see a tragedy or a disaster in their willingness to emigrate. The Palestine Royal Commission did not shrink from the suggestion. Courage is infectious. Since we have this great moral authority for calmly envisaging the exodus of 350,000 Arabs from one corner of Palestine, we need not regard the possible departure of 900,000 with dismay. The writer, as he has already said, cannot see any necessity for this exodus: it would even be undesirable from many points of view; but if it should appear that the Arabs would prefer to migrate, the prospect can be discussed without any pretence of concern. There is, moreover, one great ethical difference between the case of Palestine and that of all the other poly-ethnical areas...In all the other areas friction is caused by ambition: one section wishes to dominate, or so at least the weaker section fears. Such an ambition may be, or seem, justifiable or excusable, in the sense that it is an expression of inherited vitality...In Palestine any inconvenience to the native population from the influx of immigrants arises from the tragic necessity that these immigrants must find a home. It has nothing to do with ambition, nothing to do with the will to dominate over anyone...The cause is genuine hunger, the nostalgic passion of people who have nowhere else where they can make a home for themselves. That need still exists and it does not gain any sympathy with our Arabs. One can quote Jabotinsky. One must do so correctly and fairly and one must be able to adapt his principles to current realities. What Is A 'Religious War'? 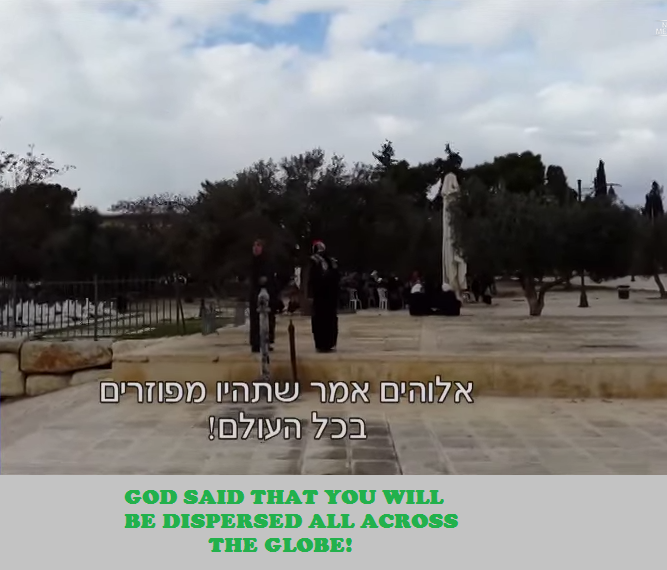 I excerpted that from a clip broadcast on Israel's Channel One TV news this past week. The Muslim women are being interviewed, or shouting their answers back, at 2:41, and they are explaining that the prohibition of Jews entering the current Temple Mount compound is "in your Torah" and "It's not me saying it. It's your own Torah." The moment non-Jews begin telling Jews what or what not is dictated by our own religion is the moment something becomes wrong. Not because we are special but because would "Palestinians" tolerate being told what "Palestinianism" is all about? Or that a Rabbi would declare that Muslims have no real connection to the Temple Mount in Jerusalem? Or that I would interpret a Quranic passage as indicating that indeed Jerusalem is really not that important to Muslims. Whose narrative is this? Would Muslims accept my "reverse inventivity" model? Would a Muslim wish the Jew to revert to a second-class citizen? Redefine us as unbelievers as in the beginning of Sura 2? And to those Jews who charge the Temple Mount Jewish activists with hypocrisy in saying 'would you permit a Muslim to pray at the Western Wall? ', I ask you: in what direction would they be facing? I don't think so and for sure, our radical progressive liberals would denounce that. So particularistic, so narrow, so anti-cultural. I did find a recent conference entitled Archéologie du judaïsme en France et en Europe but if my French is still good, that should mean the 'archaeology of Judaism' otherwise the adjective 'juive' should have been used. Whilst in the past Islamic archaeology was often regarded as peripheral to the main areas of interest within Near Eastern Archaeology it has now emerged as an integral part of the study of the archaeology of the region. Recent sessions at BANEA have incorporated papers on Islamic archaeology both within the general sessions and within workshops however there has not been a specific session which addresses some of the issues of particular significance to the Islamic period (approx. 622- 1914). Islamic archaeology was last represented as a special session at BANEA in the 1990’s since then there have been many developments including numerous fieldwork projects, a large number of synthetic and thematic studies, several introductory books and most recently the launch of a new journal Islamic Archaeology. In view of these developments it seems appropriate to have a workshop which looks at the current state of this rapidly growing field of enquiry within Middle Eastern Archaeology. Will there be a paper at that session dealing with this? State Comptroller's report finds that the Muslim religious trust carried out works without permits and used heavy equipment damaging the Jerusalem holy site. And if want to assist with salvaging the damage done on the Temple Mount by the Islamic Waqf (a Jordanian institution), go here. was probably dealt with adequately at the time. Slavery was and is evil. It endnagered lives for sure. But it wasn't certain death. 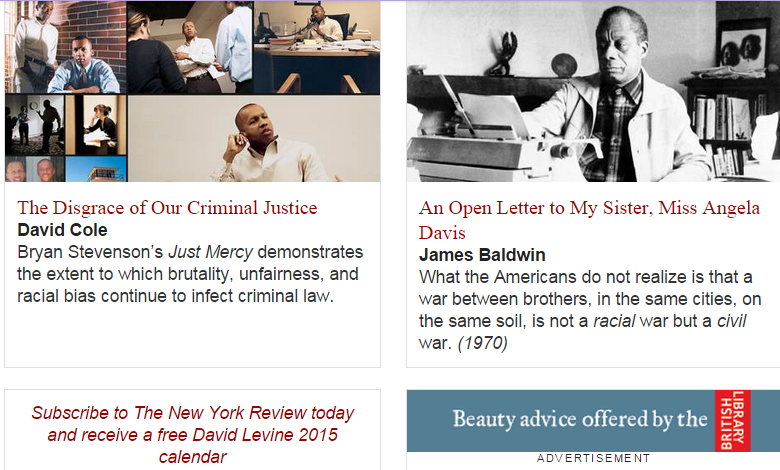 Why NYRB saw fit to highlight your letter now is one matter (hint). That your hyberbole is repeated is the problem. "Avishai Raviv was an agent of Israel's Shin Bet or Shabak, Israel's domestic intelligence service whose mission was to encourage and fabricate activities of right-wing extremists. His code name was 'Champagne'. Raviv was a student at Tel Aviv University and was expelled for violent behavior. He was later a student at Bar Ilan University. Under orders from the Shin Bet Raviv created Eyal to perpetrate acts of violence to discredit the Israel right wing. Raviv recruited Yigal Amir, a religious law student from Bar-Ilan University, who fiercely opposed the Oslo Accords. At one protest, Raviv was filmed with a picture of Rabin in an SS uniform prior to Rabin's murder. Raviv allegedly knew of Yigal Amir's plans to assassinate Israel's prime minister, Yitzhak Rabin, based on a controversial classification of handing over Jewish land in the category of "din rodef" ("law of the pursuer"). According to Jewish law, anyone who is classified as a pursuer, must be killed immediately...Uri Dan, a journalist close to Ariel Sharon, wrote that witnesses heard Raviv tell Amir: "Be a man! Kill him already!" After Rabin was assassinated, the journalist Amnon Abramowitch revealed that Raviv was an agent of the Shabak. Raviv was brought to trial in 2000 for not preventing Rabin's assassination. Raviv mounted a successful defense on the grounds that he had just been doing his job and events had spun out of control. “Anyone who wants to change the status quo on the Temple Mount should not be allowed up there,” Police Insp.-Gen. Yohanan Danino said Tuesday, criticizing Attorney General Yehudah Weinstein for enabling right-wing politicians to incite Arab unrest by visiting the disputed holy site. First, he clashes with another government official. Third, he forgets parliamentary immunity. Fourth, he points an accusatory finger at the victims of violence hwo only seek what the law guarantees them. Fifth, he is perceived as letting off the Muslims despite their violcnce. Will he resign or be forced to do so? Did this appear in print? What transpired in the West Bank last night was entirely predictable, widely anticipated, and, yet, seemingly inevitable. What transpired in Ferguson last night was entirely predictable, widely anticipated, and, yet, seemingly inevitable. Salaam Aleikum, my name is Ahmed. I reside in Jerusalem, I study at the University a thing or two. Sending a Jew or two to Hell. Then I'll bring down on it a sharpened hatchet. I live in the country's center. And behind it some cooking gas balloons. Many many of them will not be. Then I'll shoot straight into it. Tuesday, 25 November, 2014 / 3 Kislev 5775President's Residence Cancels Invitation to Israeli Singer Amir Benayoun The office of the President of Israel has announced that following the release of his song this week, it would not be possible for Israeli singer Amir Benayoun to perform as planned as part of events scheduled to mark the exile and expulsion of Jews from Arab Lands and Iran, due to take place at the President's Residence this coming. Director General of the President's Residence Harel Tubi stated in a letter to the event organizers, "Against the background of the release of Amir Benayoun's latest song yesterday, I wish to notify you that we will not be able to allow him to perform at the President's Residence. Amir Benayoun is a renowned and exceptional artist, and his talent has greatly contributed to Israeli music. However, his statements made at this time of conflict and tension, even if uttered out of frustration and pain, do not, to say the least, help bring calm to the streets, and are inconsistent with the responsibility required of the President's Residence, and of all institutions with influence over the public discourse, to work to alleviate tensions, and promote cooperation rather than division in Israeli society." Minister for Senior Citizens, Uri Orbach (Jewish Home) issued a response to the move shortly after the announcement was made, saying that he would cancel his own appearance at the upcoming event out of deference for Benayoun's rights. "The cancellation of singer Amir Benayoun's concert at the President's house, marking the expulsion of Jews from Arab Lands and Iran, contradicts our position," Orbach stated. Orbach added that while he respects Rivlin, he views the cancellation as an infringement on freedom of expression. "Punishing artists due to their opinions is an impermissible act, so unfortunately I cannot attend," he said. "If Benayoun isn't singing, I won't speak." And over at Ayelet Shaked's FB (Hebrew). In a synagogue of yours, Father. That all should be well. That if only it would be. Before your very eyes, Father. In front of the Holy Ark. In front of the Holy Ark - until when? More suffering orphans who again wait for the Devil to burst out in dance. To renew death every day again? 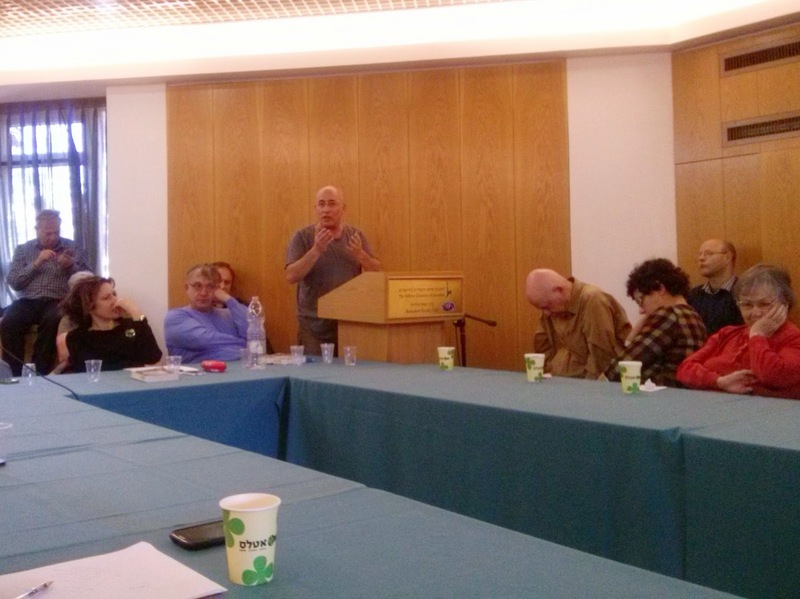 This is Hebrew University's Dr. Hillel Cohen addressing last Tuesday an intimate conclave arranged for his year-old book, "1929 - The Zero Year of the Jewish-Arab Conflict" (in Hebrew: "Tarpat: Shnat Ha’efes Ba’sihsuh Hayehudi-Aravi"). The session was, unfortunately, quite characteristic of the sorry state of academic scholarship on issues of the Arab-Israel (or Jewish-Muslim) conflict. 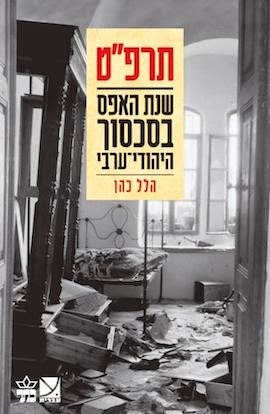 The moderator, Dmitry Shumsky and the three other discussants - Israel Bartal, Vered Vinitzky-Serussi and Raef Zarik - were all of one persuasion, to the left in varying degrees, and cheered and applauded the book. It's not that because I am at an opposite ideological pole that I criticise this lack of balance. The fact is that the book came under sharp criticism by Anita Shapiro, Benny Morris, Avi Becker, Eliezer Schweid, and others. These are not lightweights. And yet, the people at the Hebrew University who organized the event seemingly could find no one who disagreed with the book's scholarship, methodology or conclusions to speak? Were they cowed or are they of a special frame of mind that tolerates no deviation from the 'line'? Cohen realized that from a Palestinian perspective, the story of Tarpat is different from the one he knew. And this is what interested him: How did it happen that the Arabs perceived reality so differently from the Jews? he presents information not known before or not sufficiently highlighted. That the Arab attackers felt provoked by Jewish moves to change the prevailing arrangements in the Western Wall prayer space, that rumors of atrocities committed by Jews against Arabs fueled the wrath of Arab rioters, that Jewish attacks on Arab pedestrians in Jerusalem and Tel Aviv preceded or coincided with the Arab attacks, that Jews also murdered Palestinians in the course of the events, though not on a large scale, that many Palestinian residents helped their Jewish neighbors by standing up to the attackers and preventing them from harming Jews, that no solid evidence exists that the Palestinian leadership – especially Hajj Amin al-Husseini, the grand villain of Zionist historiography – incited the rioters, let alone that they operated on its instructions, that the British forces did not facilitate the attacks and usually tried to stop them but were not always quick enough, and so on. In short, Cohen's book seeks to even out the playing field by turning events on their head, which doesn't bother Haaretz's Uri Misgav. Is all that not really known? Of course not. That narrative was and has been the Arab version since before 1929. It's all been published. Almost nothing in his book has not appeared in previous books although for sure there are additional research elements that he brought to light and for that, history is enriched, especially his readings from the Arabic both contemporary accounts and others. His book does lack a full review of sources. For example, this article, "The "Western Wall" Riots of 1929: Religious Boundaries and Communal Violence" by Alex Winder in the Journal of Palestine Studies, Vol. XLII, No. 1 (Autumn 2012), provides additional background and information and while sympathetic to the Arab cause, it also affords an insight into the element of the integration, or not, of the Oriental Jews within the Arab majority, a theme highly prominent in his book. It does not fully support Cohen's narrative and even undermines it. Hillel, who is a friend who I have known for over 30 years since he was a teenager, I think, is quite sincere but his paradigm in unchageable no matter what he says of his ability to be both a Zionist and its critic, an unfair critic to my mind. He almost cried when he said that today's situation parallels to an extent the 1929 period and he foresaw, if nothing appropriate is done, hundreds of dead in the near future. His book, I found, on one level, is very detailed and tells the story is an absorbing fashion and, indeed, Hillel informed the attendees that he purposefully wrote it for the younger generation, those who do not know the history. On another, there are no maps. too few pictures, no replication of newspaper headlines and the such. but no picture of the desecration although one would think that there would be one. It indeed happened but too what extent? Today, it would be no more than a 'price-tag' incident, serious but not equal to hacking off people's limbs. By the way, incidents like this were not unknown in the British empire. 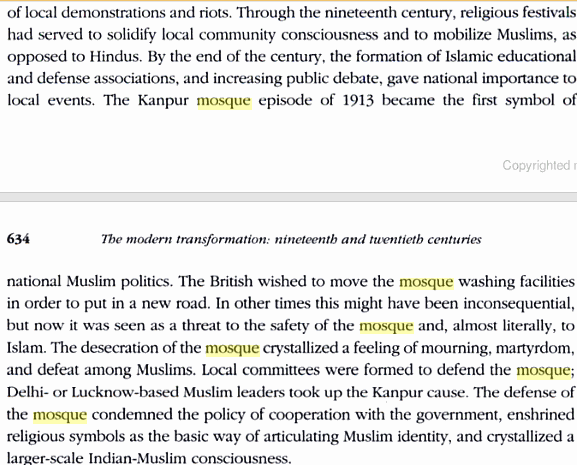 In August 1913, there was the Kanpur riots in India. Seems incendiary situtations were not unique to the Arab-Zionist struggle. On p. 124, he notes a bomb having been set off near the house of a sheikh involved in inciting against Jewish worshippers at the Western Wall but writes "On one of the nights of 1927...". It took me less than an hour to find out that that incident occured on the night of August 31/September 1 and I have a scanned newspaper clipping. Oh, and it was a Hagana operation. Am I a better researcher than a Doctor who lectures at a University? and attempts to suggest that Hews first attacked Arabs there rather than Arabs who poured out of the Damascus Gate, incited by immams at the Temple Mount, who began to sweep up the street heading for Meah Shearim. He also tries to re-time events that also there attacks on Arabs preceeded attacks on Jews. It's as if he's a conspiracy theorist. The book is invidious and the conclave was an embarrassment. On another of his books. According to an anonymous "Former Commander", Israel Made a 'Strategic Mistake' last summer. Given rising regional tensions over Israel’s perceived plan to alter the delicate status quo governing the holy Temple Mount in East Jerusalem, any minor tactical action could spark “a religious war of strategic proportion,” the retired commander warned. “The Temple Mount is a game changer, and any attempt — or perceived attempt — to alter the status that has more or less kept the peace since 1967 will insert God into this conflict,” he said. I do not dispute the thinking there but by problem is with the "perceived plan" bit. If the Arabs can perceive reality which isn't, assume a truth which isn't, what is the use of doing anything rationale? In this situation Israel can declare morning-to-night that the status quo wil not be altered by the government but the masses won 't believe that and will, perhaops, escalat the violnce. What then? What is the strategic perparation for that? The defense against that? How we prevent "regional fanatics" from starting a Holy War if they want to? And if he insists upon being anonymous, I don't perceive him as an expert. 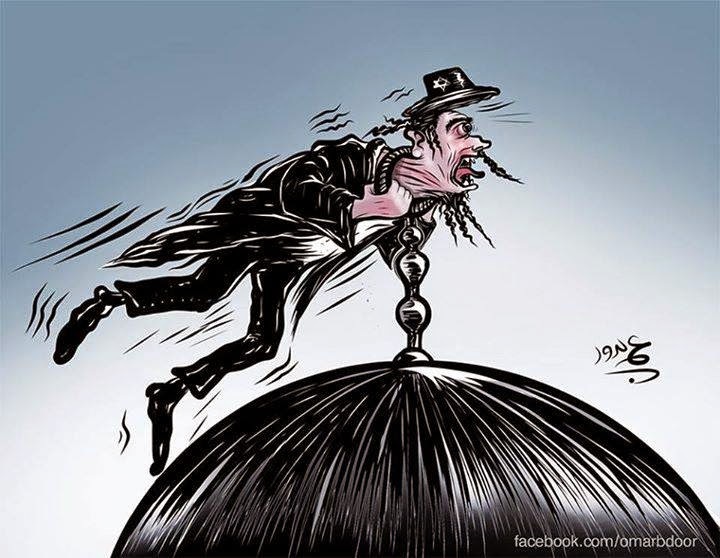 I had uploaded Arab caricatures and cartoons with anti-Semitic themes earlier this year. ...The generals of Antiochus's armies having been defeated so often, Judah Maccabee assembled the people and told them that after the many victories which God had given them they ought to go up to Jerusalem and purify the Temple and offer the appointed sacrifices. So he chose some of his soldiers and gave them an order to fight the men that guarded the upper city until he has purified the Temple. When therefore he he had carefully purged it he brought in new vessels -- the menorah, the table and the incense altar, which were made of gold, and hung up the veils at the doors and restored the doors themselves. He also took down the altar and built a new one of stones that he gathered together, and such as had not been hewn with iron tools. And on the twenty-fifth day of the month Kislev...they lighted the lights that were on the menorah, and offered incense upon the altar, and laid the loaves upon the table, and offered whole burnt offerings upon the new altar. But in recent times, radical Right-wingers have refused to be satisfied with this [being allowed to visit the site under supervision but not permitted pray there] and have begun clamouring for prayer rights inside the compound itself. This has led to an increasing number of visits to the mount by Israeli activists, some of whom are said to have prayed surreptitiously, triggering clashes between Palestinians and the security forces. This in turn has fuelled Palestinian accusations – refuted by Benjamin Netanyahu's government – that Israel is intent on overturning the status quo on the compound, which forbids Jewish prayer and cedes administrative control to Jordan. 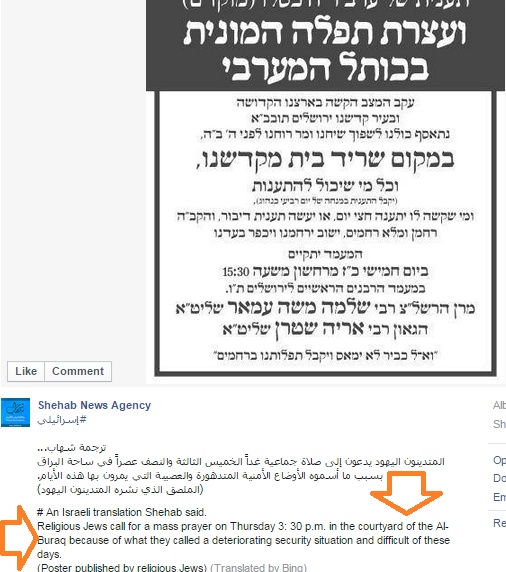 Yet the idea of Jewish prayer on the site is anathema even among many religious Jews. Many refuse to visit the site lest they enter an area where the Holy of Holies once stood, the most sacred part of the ancient temple and the place where the high priest – who entered only once a year on Yom Kippur (the Jewish day of atonement) – is said to have communicated directly with God. 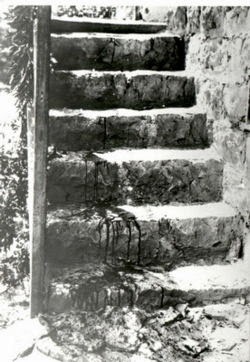 According to tradition, ordinary Jews were forbidden to go to the Holy of Holies – whose precise location is unknown – because they were ritually impure. Jews are at fault because we stand on our rights? As for this bit in there - "The site has been a flash point since the advent of modern Zionism. More than 100 people on each side died in a week of rioting in 1929 over access to the Western Wall below" - see here. But, again, the onus is placed on the Jews. Arab intransigence, unwillingness to compromise or agree to arrangements of coexistence, their fanaticism and violence are ignored, downplayed or excused. The Arab terrorists are only a faction or has the entire "struggle" of the Arabs-who-refer-to-themselves-as-'Palestinians' been mainly extreme throughout all levels of the population? Until the early twenties, before the massive influx of European Jewish immigrants, both Christians and Jews were ethnic minorities. Whereas the Greek Orthodox Christian indigenous population maintained its own class structure and social position through the centuries, which was deferred to by the Muslims, the Jewish community, because of the transience of its members, was less rooted. 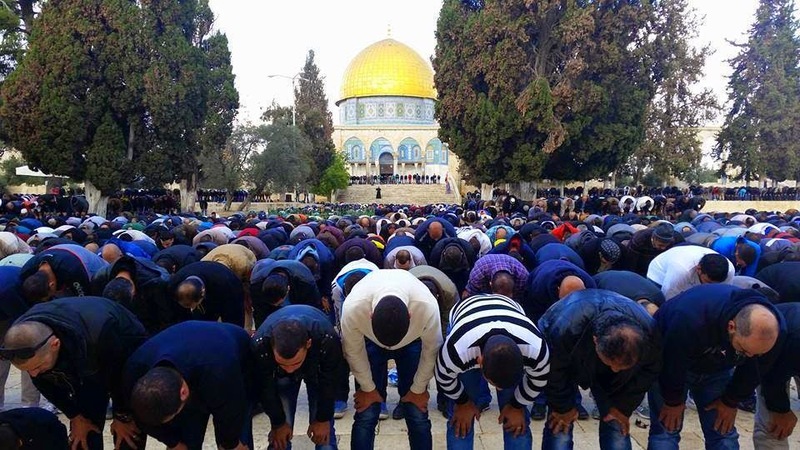 Islam does not prohibit outsiders from praying at Al Aqsa. The problem, he said, is that Parliament members have declared rebuilding the temple as their real goal. No non-Muslim can pray there or read from the Bible. That includes Christians. Their rears directed towards the sacred rock under the Dome since they turn towards Mecca. All the news that fits the NYTimes' agenda. "More than 100 people on each side died in a week of rioting in 1929 over access to the Western Wall below." 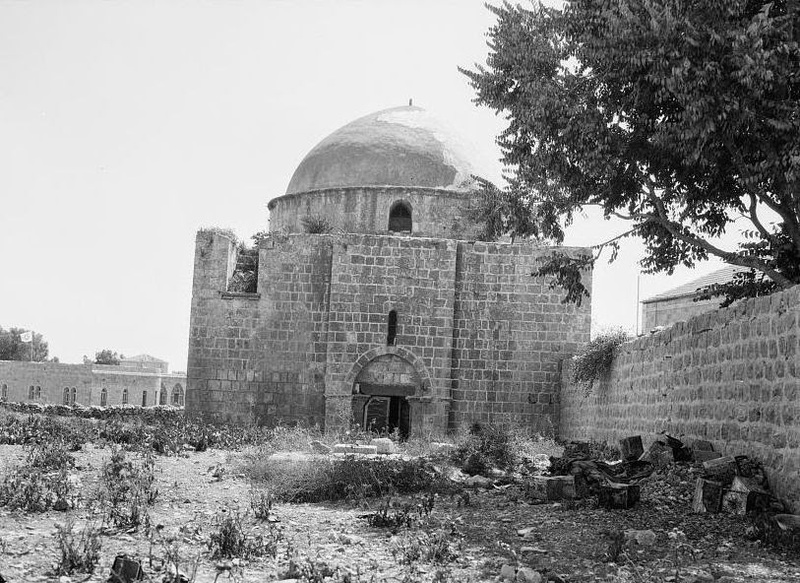 In 1929, after an incident at the Western Wall during Yom Kippur of 1928, following almost a year of vicious Islamic propaganda, intentional violent attacks of Jewish worshippers, passing donkeys through the small courtyard after opening a doorway in an Arab house, playing clanging Dervish music and more, the Mufti Amin El-Husseini organized murderous riots throughout the country in mid-August 1929. The number of Jews murdered were 135, some of the victims raped, dissected and otherwise put to a horrible death. The riots lasted almost three weeks. 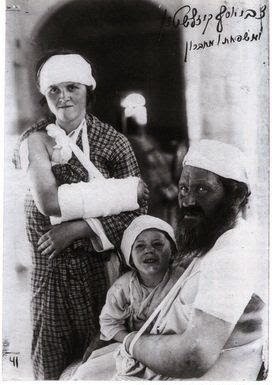 A few Arabs were killed, seemingly, in revenge attacks, but the vast majority of the 116 Arabs who "died" were killed in self-defense by Jews but actually mainly by British police and troops while trying to restore order and protect the Jews. The Jews did not die. Babies crushed against doors, being swung by Arabs. There is - and can not be - any moral equivalency in this matter. In Jerusalem the Government published a refutation of the rumors that the dead Jews of Hebron had been tortured before they had their throats slit. This made me rush back to that city accompanied by two medical men, Dr. Dantziger and Dr. Ticho. I intended to gather up the severed sexual organs and the cut-off women's breasts we had seen lying scattered over the floor and in the beds. 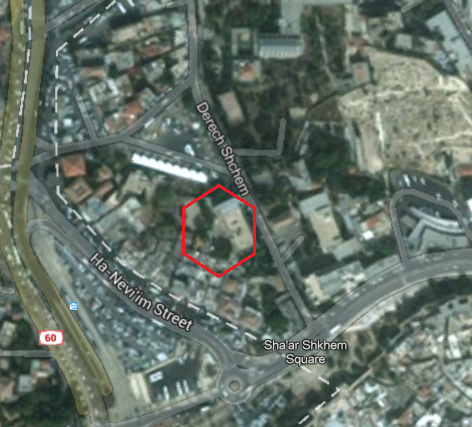 But when we came to Hebron a telephone call from Jerusalem had ordered our access barred to the Slonim house. A heavy guard had been placed before the door. Only then did I recall that I had inadvertently told a fellow newspaperman in Jerusalem about our gruesome discoveries. Bill Bryson, in his Notes from a Small Island, wrote. I am constantly filled with admiration at this – at the way you can wander through a town like Oxford and in the space of a few hundred yards pass the home of Christopher Wren, the buildings where Halley found his comet and Boyle his first law, the track where Roger Banister ran the first sub-four minute mile, the meadow where Lewis Carroll strolled; or how you can stand on Snow's Hill at Windsor and see, in a single sweep, Windsor Castle, the playing fields of Eton, the churchyard where Gray wrote his 'Elegy,' the site The Merry Wives of Windsor was first performed. Can there anywhere on earth be, in such a modest span, a landscape more packed with centuries of busy, productive attainment? Mir Yeshiva. Porat Yosef Yeshiva. How Safe Are Police Helicopters? What About the Other 'Status Quo'? Static Status Quo or a Variable One?